Portland, Ore. – January 22, 2013 – Welcome to “Pear World!” The growers of USA Pears are pleased to announce the debut of this new online destination for elementary school-age children. The website – found at http://pearworld.kidzsmart.com as well as under the “Kids and Classroom” section of www.usapears.org – brings the pear orchard to life to engage and educate children about pears, one of the most popular fruits consumed by Americans according to the FDA. The colorful, interactive new site encourages families to include pears as they strive to make half their plate fruits and vegetables as recommended by the current Dietary Guidelines for Americans and the USDA’s MyPlate initiative. 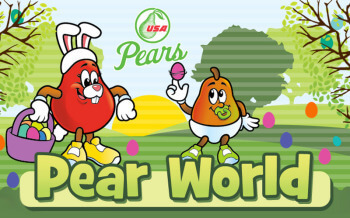 Pear World features the USA Pear mascots, the “Pear Buddies,” a friendly and physically active crew of different varieties of pears, each with their own color, shape, and personality. Popping up in eye-catching illustrations and animations throughout the site, the Pear Buddies guide children through kid-friendly recipes, activities, and information. Kids and parents alike will enjoy Pear World’s visual playfulness, which includes an interactive “Living Orchard” that changes with the seasons – just like life in a real pear orchard. Holidays are also celebrated in the Living Orchard – regular site visitors will be rewarded with special décor and animations, from tree ornaments to fireworks. The Pear Orchard – Kids will come here to learn about the ten different varieties of USA Pears, where they are grown, and how they get from the orchard to the grocer. The Pear Kitchen – This section is full of pear recipes that kids will love to make and eat, plus it includes kitchen safety tips and a kid-friendly introduction to cooking tools and utensils. The Pear Lab – With arts and crafts, hands-on educational ‘experiments,’ and fun games, this section is sure to be popular with kids, parents, and educators. Today, the United States is the second largest pear-producing country in the world, and Oregon and Washington comprise the nation’s largest pear growing region with 1,600 growers producing 84% of all fresh pears grown in the United States. Pears grown in these two Pacific Northwest states are distributed under the “USA Pears” brand.